Enhance the default frontend experience of your e-commerce store with the Magento 2 Popup Widget extension by Mageworx. This module is designed to provide you with all popup types and unique widgets. Below, we explore its functionality in more details. You can find a comparison of Magento 2 popup extensions here: Magento 2 Popup Extensions Comparison. 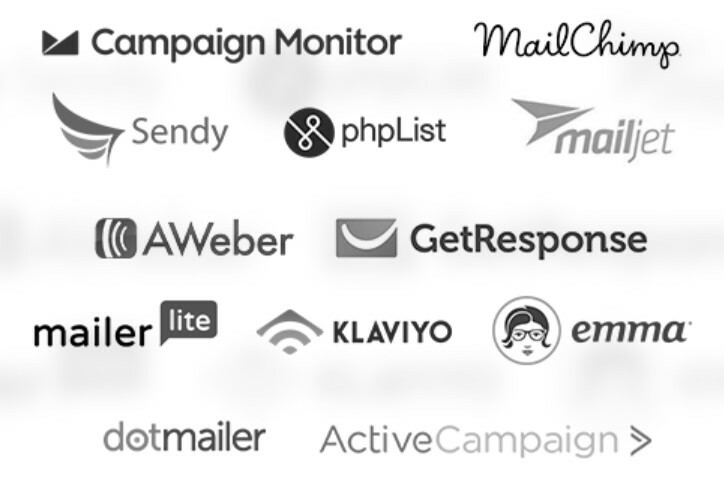 Advanced integrations with email services and in-depth analytics are also on board! With these features, you can effortlessly deliver the right message, for the proper audience, at the best time. Let’s explore each function in more details. With the Magento 2 popup extension by Mageworx, you can create any popup message. You can place it in the center of the screen or push to the top/bottom ribbons. The popup can be displayed when a customer visits your store or leaves it. Other options include timed, floating, scroll, mouseover, and full-screen messages. With this variety, you can create an exact marketing tool and an entirely new channel of interaction with customers. Furthermore, Mageworx lets you combine the standard platform’s widgets with the advanced ones. Thus, you can get many more new options. And due to dozens of ready-to-apply templates, you don’t need to spend hours of time, configuring the extension. Just choose the right look and set its targeting options. You don’t need to be a professional designer to create an eye-catching message. There is even no need to know HTML to do that! At the same time, you can create your own popups. 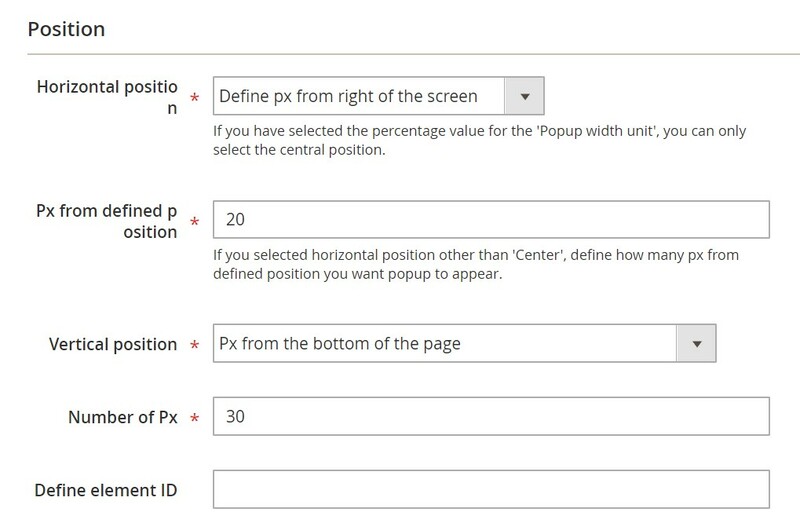 With the Magento 2 Popup Widget extension, you only need to specify several parameters, including size and dimensions, colors for various elements, styles for multiple elements, visual effects, etc. Various placement and positioning options also turn the module into a robust marketing instrument. The extension allows you to display your message on any store page including catalog, home, and cart. You can create both horizontal and vertical popups and chose nonstandard positions for them to attract additional attention. 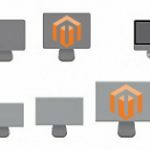 Multiple popup display scenarios are also possible with the Mageworx Popup Widget Magento 2 module. The most apparent trigger is the page load or an action that happens after it. Besides, you can launch a timer so that the popup is displayed after a specific interval a customer spends on your store or a particular page. It is also possible to specify the number of pages to be visited to display the popup. Scrolling can also be used for the same purpose. And if a customer hovers over a specific page element, it can be considered a trigger. As mentioned above, an attempt to exit your e-commerce store can be used to display the message as well. For some triggers, the extension lets you set the popup frequency and configure other parameters. 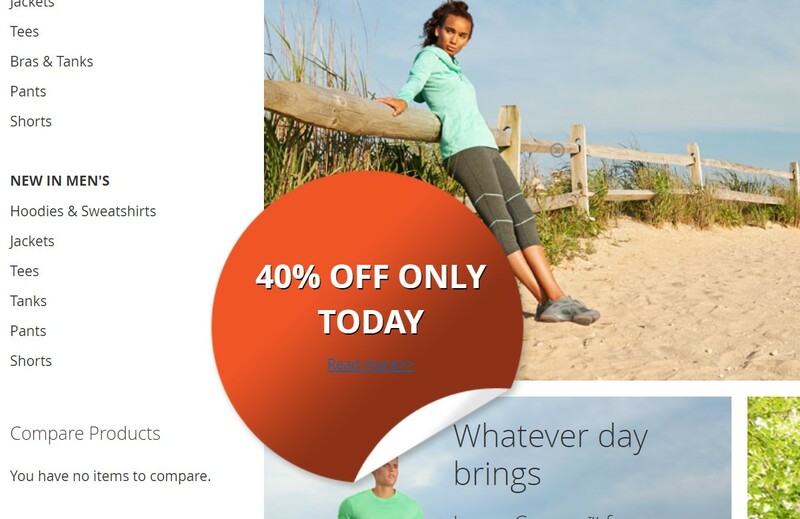 Behavioral targeting is another competitive advantage of the Magento 2 Popup Widget extension by Mageworx. You can quickly create specific messages aimed at particular customers. Segment your shoppers to display custom popups on the basis of browsing behavior, location, device type, incoming traffic, products in the cart, customer group, time frames, etc. As for the advanced analytics, Mageworx allows exploring average time per view, and the number of visitors who have closed the popup or clicked on it. 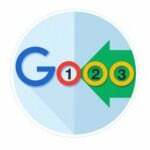 There is also Google Analytics events tracking support as well as a list of planned features. Now, when you know all core features of the Magento 2 Popup Widget extension by Mageworx, let’s take a look at its backend section. In the configuration section of the Magento 2 popup extension, you can add a subscriber’s email to the Magento Newsletter list. Note that it is a default feature that must be disabled if you use an external email service. Next, enable the integration with any of the available providers. All popups are gathered in a grid that displays not only the ID, name, and status of every popup but also the stats mentioned above. Besides, you can edit, preview, and duplicate every popup right via the corresponding link in the Action column. While creating or editing the popup, you have to deal with six tabs of settings: Popup Information, Settings, Position, Appearance, Conditions, and Cart Conditions. In Popup Information, specify a popup title and select a content type. You can either upload an image or use an editor. 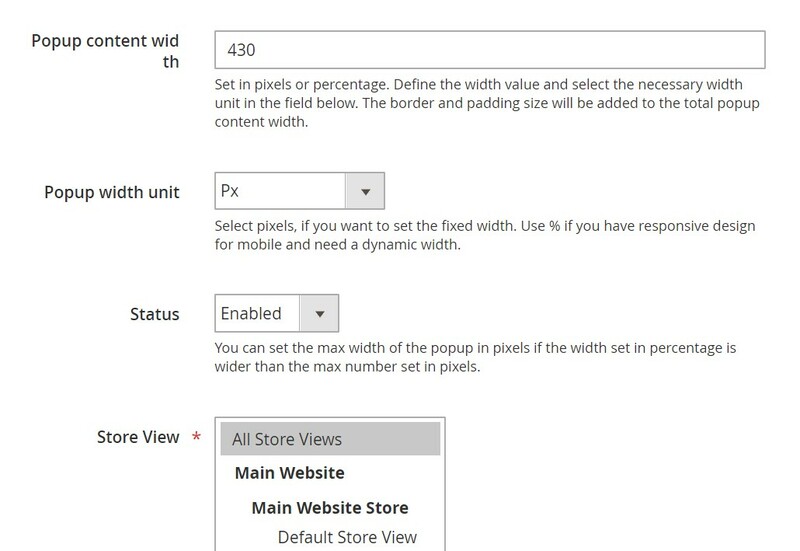 Next, specify a popup content width and a width unit (pixels or percentage), enable/disable the popup, and choose a store view to display the message on. Now, you can specify a page where the popup will appear. 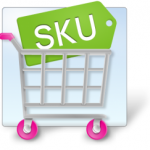 It is possible to select one of the following options: Home, Product, and Category pages, checkout, or cart. Alternatively, you can define a custom url. The Magento 2 Popup Widget extension by Mageworx provides the ability to use patterns to add the message to the pages which have a specific word in a URL. For instance, “%8-gb%” will let you display the popup on all pages where “8-gb” is a part of the URL. It is useful for displaying an add with a memory card for devices with only 8 GB of native memory. 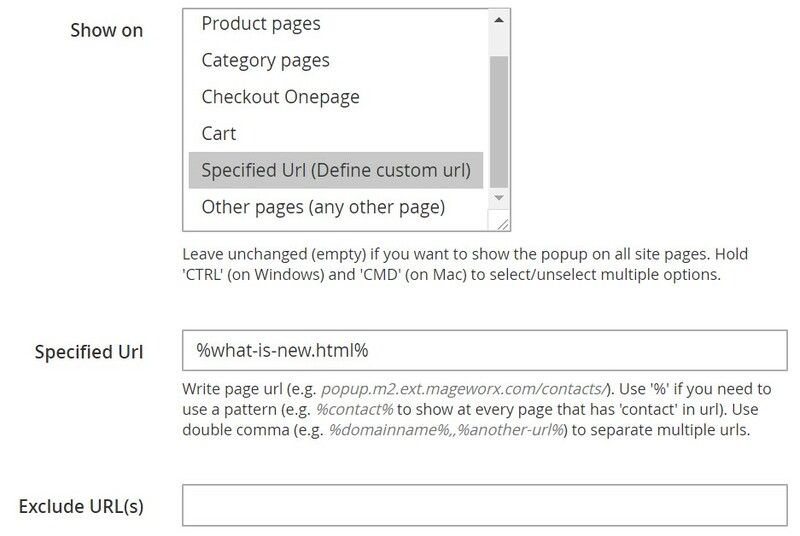 Besides, there is a field that allows you to exclude specific URLs from the available popup options. Next, specify the display behavior and an interval to display the popup. It was just the first tab, but we can proceed to the popup Settings section now. Specify a display frequency. There is a huge list of parameters to choose from. Some of them rely on the cookie lifetime, so it is the second parameter to be configured in this tab. Next, enter a cookie/popup ID that will be used for A/B tests. Besides, the section allows you to specify a time interval to track statistics and enable close on click outside the popup. Alternatively, you can specify a time interval to close the popup automatically and stop further popup display. The priority of the popup is the last option in this section. The Position options have the following appearance. The Magento 2 Popup Widget extension by Mageworx provides lots of flexible conditions so you can place your message anywhere on a page. It is even possible to specify a page element to display the popup. As for the Appearance tab, it also includes lots of parameters. You can select a style of popup corners, specify border color and size, choose a background overlay, type a padding size, pick a close icon style, enable various effects, and even add custom CSS and JS. 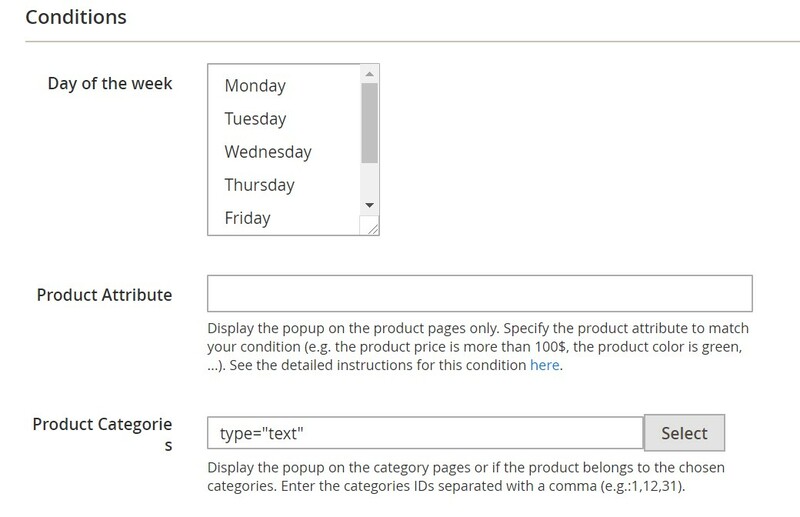 In Conditions, specify days of the week to display the popup. Note that you can add product attribute, define product categories and countries to make the display more precise. Other parameters include a device type, enabled/disabled cookies, logged/unlogged status, newsletter subscription, referral URLs, returning or new visitors, a number of visited pages, customer groups, and even a customer IP. Thus, you can enable the most precise popup display in just a few clicks. And of course, you can fully customize the display of the popup in a cart. Display the message if the cart is/isn’t empty or apply a more precise configuration. 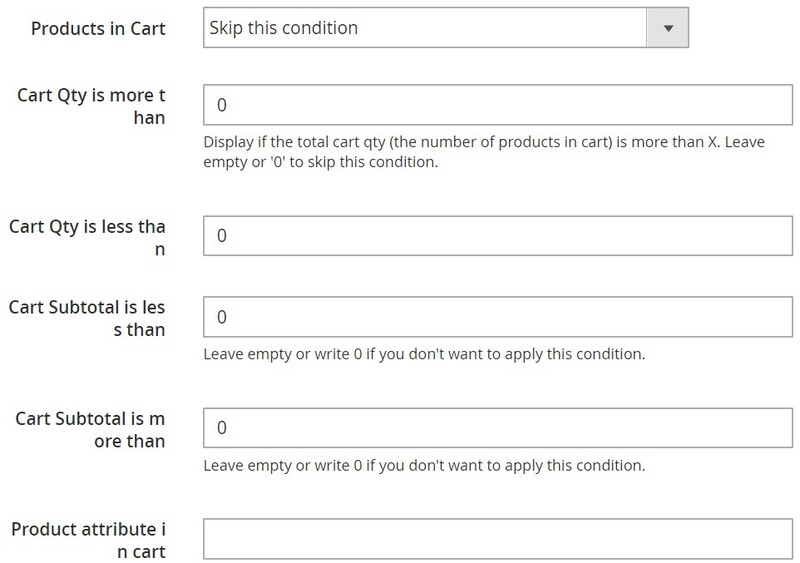 Use the following parameters as a trigger: cart quantity and subtotal, product attributes and categories. Now, when you know how to configure the Magento 2 Popup Widget Extension by Mageworx and create a new popup window, we can proceed to the frontend appearance of the module. For more popup examples, visit the official page of the extension. Hit the link below the post to get all the necessary information.